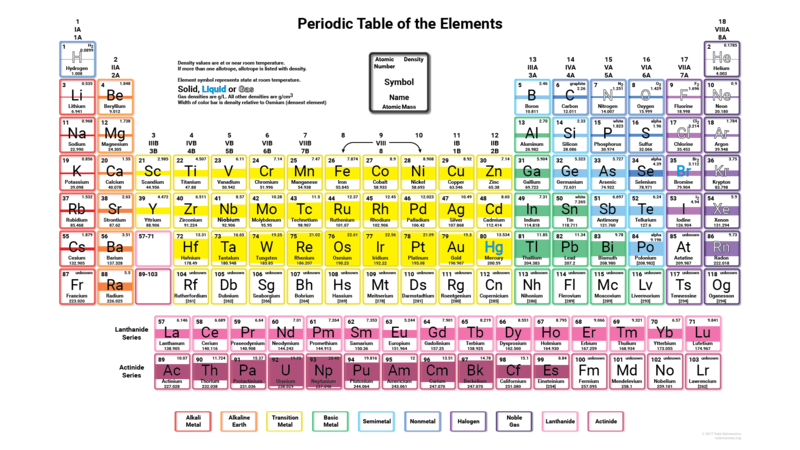 Here is a table listing the density of elements of the periodic table. The values are for density around room temperature, except as noted. Elements are listed alphabetically. Keep in mind, density depends on temperature, pressure, and the allotrope (form) of the element, so true values may be a bit different. More of the heavier elements have not been synthesized in large enough amounts for experimental data to be taken, but predictions are available for these elements. All 118 elements are listed in this table. The element with the least density or lightest element is the gas hydrogen, with a density of 0.0899 g/cm3 The element with the highest density is usually cited as the metal osmium (22.61 g/cm3), although under certain circumstances iridium can have a higher density (22.65 g/cm3). Note some of the more recently synthesized elements may have higher densities, but this has not been confirmed yet. References: International Union of Pure and Applied Chemistry and Wolfram Research, Inc.